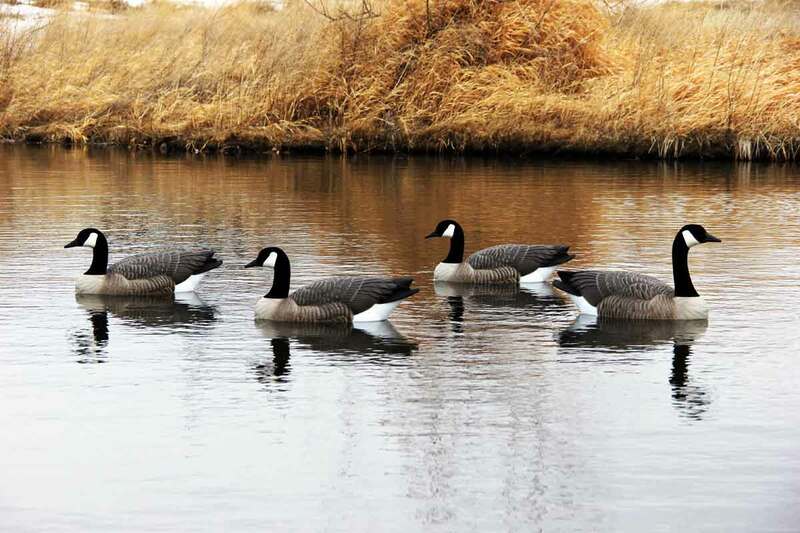 Modern decoys resemble live birds. In 1918, Joel Barber began a new era of waterfowl decoys. Barber spent much of his life collecting and showcasing various decoys and even wrote a popular book on the subject 1934 titled, Wild Fowl Decoys. From here on the keystone component of waterfowl hunting becomes the decoy. It is also an authentic piece of Americana. So how did decoys come to be? Their history may go further back than you would expect! Believe it or not Native Americans first put waterfowl decoys to use over 2000 years ago, possibly the Paiute Tribe of the Southwest. Evidence of these decoys was found in 1924 at the Lovelock Cave in Nevada. Here, archeologists found a cache of 11 waterfowl decoys that resembled the canvasback duck. The decoys cleverly crafted out of Tule reed are thought to have been used on the now dry Lake Humboldt. The practice of using decoys spread throughout tribes and caught the eye of early settlers in the 17th century. With an abundance of waterfowl available throughout the “New World”, settlers began relying on decoys to improve their chances of luring in waterfowl. These decoys vary in style but were primarily carved out of wood and painted to mock the local waterfowl. Towards the 1800s, waterfowl became a staple food source for growing populations. “Market gunners” began to make their way to the scene by hunting vast amounts of waterfowl and commercially selling them to the public. These market gunners helped popularize the use of decoys and used huge punt guns to take out up to 100 waterfowl at once. Since this was a profitable market, decoys evolved into more efficient and realistic designs to help improve hunting. After noticing the wide use of waterfowl decoys, companies like Mason Factory and Peterson Dodge began producing an abundance of decoys at the end of the 19th century. These companies used cedar wood and vibrant lead-based paint to produce top of the line decoys. With no formal regulations protecting the waterfowl, migratory patterns and populations became a point of concern. This led to the Migratory Bird Act of 1918. It brought an end to the “market gunner” era and established bag limits and hunting seasons to help protect the dwindling waterfowl populations. With so many decoys on the market, hunters and the general public began looking at the decoys not only as a piece of hunting equipment but also as piece of art. With the help of Joel Barber and various other collectors, we now view decoys as a brilliant piece of Americana. These decoys can be so collectable, that in one auction a single decoy brought 1.13 million dollars! While decoys can be highly collectible, they still meet their initial intention of attracting overhead waterfowl. For the past 2000 years and counting, the waterfowl decoy has transformed tremendously. But it has always had the goal of improving a hunter’s chances. Now with 21st century technology, decoys are made of canvas, plastic, and paint to deliver supreme realism and performance. DOA Decoys (www.doadecoys.com) hand-crafts high-quality waterfowl decoys in Algona, IA. After spending months reviewing the art portfolios of some of the most renowned waterfowl carvers in North America, they stumbled upon not one but two world class, world champion carvers who would combine their unrivaled mastery of wildfowl carving to create the perfect line of gunning decoys. NOTE: Justin Sieverding has spent most of his life hunting waterfowl in South Dakota and throughout North America. He has a true passion and vast experience in everything related to waterfowl hunting including decoy spreads, bird patterns, scouting and calling. Kyle with hybrid crappie weighing 2 plus pounds. Although our quarry of choice today is the Black Crappie, the discussion soon turns to the four types of crappies here in southern Illinois on Kinkaid Lake. As we pull out of the cove concealing Paul Ice Boat Ramp, Kyle explains that the really large “Black Crappie” of the lake is actually a hybrid. The other species in the lake are Blacknose crappie, black crappie and white crappie. 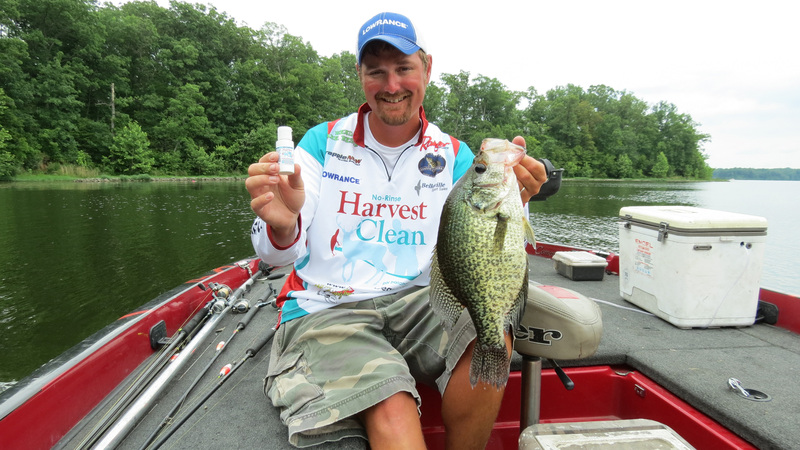 Kyle Schoenherr is a professional crappie angler and local guide. He has consulted with biologists about the hybrids and all seem to agree with his assessment of the genealogy of these big fish. A number of Kyle’s clients have caught crappies over 2 pounds. All of the big fish have certain traits in common. He has shown images of the fish to biologists in KY and TN and they refer to them as Coosa River Hybrids. 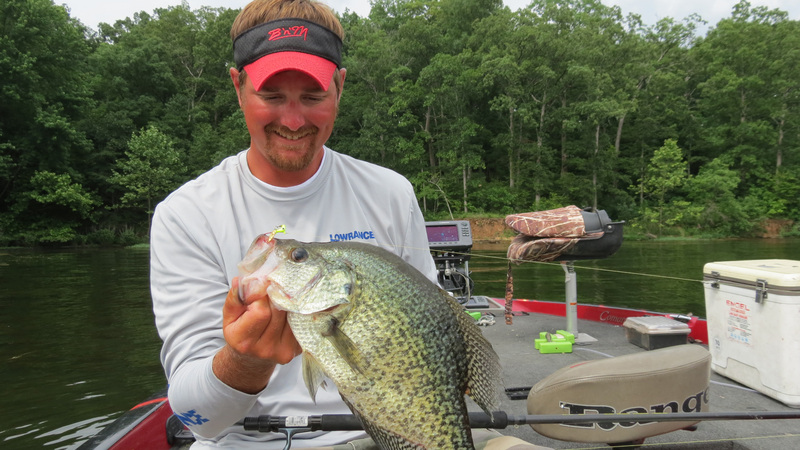 Kyle has found similar fish in KY Lake and the Alabama River while fishing tournaments. The hybrid fish resemble the white crappie generally except they have 7 or 8 spines in the dorsal fin and their color is reminiscent of the black crappie. White crappies have 6 spines. The hybrids have the speckled pattern on the sides but also have vertical bars which the whites do not display. The fish grow quickly and have some of the habits of both the white and black crappie. They appear to be a naturally produced hybrid and not one introduced to the lake. An internet search finds that the first Hybrids came from Arkansas where they were the offspring of Blacknose crappie and the true white crappie. 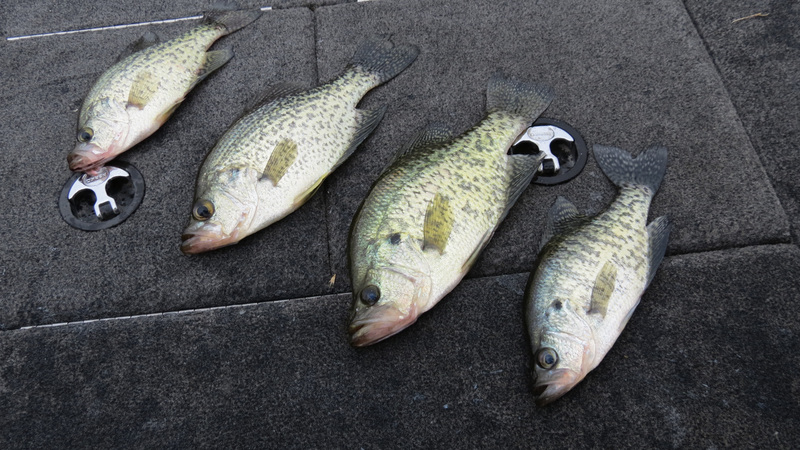 Kinkaid has two populations of introduced Blacknose crappie. One was introduced in September of 2010 and the other in August of 2012. The literature maintains that hybrids appear naturally but are not common. They have the physical appearance of one species and the spine count of the other. The biggest crappies seem to be the hybrids. The second generation fish will reproduce but do not grow fast and are highly susceptible to predation from largemouth bass and bluegill. The first generation fish grow faster and weigh more than either the black crappie or white crappie. So it is that we find four kinds of crappie. We are catching Black Crappie, Blacknose Crappie, White Crappie and Hybrid Crappie. Watching Kyle clean crappie for clients, I am amazed at the smooth and efficient manner that all his years as a guide have produced. At this point he takes a small white bottle out of his tackle box. A new scent? A new lure? A new bait? Wrong on all counts. The bottle is a sample of Harvest Clean, (www.harvestclean.com) a deodorizing hand wash. He shook it up and sprayed onto his hands. After rubbing it liberally onto his hands, Kyle takes a paper towel and wipes them. End result is that the stink of fish is gone and in its place is a citrus odor. According to the instructions on the bottle this stuff is also good for field dressing wild game when no water is available. But, I will have to wait till dove season opens in August to give that a try. Catfish thump tasty morsels that anglers present to them. Summer must be upon us. It is the prime time for fishing for this muscle with fins. A staple of southern cooking, catfish are also available in restaurants as well as local lakes. But, it is more fun to catch your own. Here are some tips for catching your own in Southern Illinois. One top catfish producing lake is Crab Orchard Lake in the Crab Orchard National Wildlife Refuge near Marion. According to the Illinois Department of Natural Resources, the catfish population of this 7,000-acre lake is self-sustaining and has not required supplemental stocking to maintain the fishery. The Crab Orchard Lake contains both channel and flathead catfish. It also contains a good population of bullheads, a member of the catfish family that does not gain the large size of the others. Fishing for catfish is a laid back type of angling. The rigs are simple and the baits, although often smelly, are simple as well. It is a good idea to remember that catfish like cover. They are bottom feeders that hold around rocks and stumps. Once one sets the hook, the fish will do its best to break off the line. Veteran catfish anglers prefer a line that is of at least 12-pound test. The tough line helps prevent the sandpaper-like teeth of the fish from wearing or weakening the line causing a break. With high quality tough line, anglers can fish around rocky, stump infested, underwater terrain. Most often the rig for catfishing is simply a baited hook suspended beneath a float, cork, bobber or whatever you call it. Cast to a probable location and allowed the rig to sink to the level where you believe the fish are located. Bait can be live or dead. 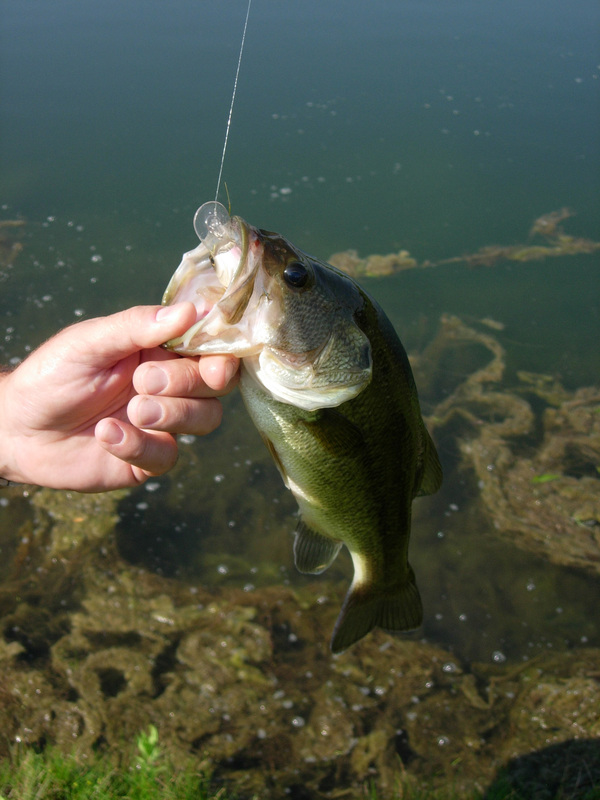 Popular baits include minnows, leeches, crayfish, catalpa worms, leaf worms, red worms, nightcrawlers, frogs, and cut bait. Cheese baits, popular in the spring, are less successful in the summer heat. During periods of overcast or drizzle, catfish cruise the flats in search of food the same as they do at night. Under such conditions, a three-way rig works well. Attach one swivel to the line that goes to the reel, the second to a drop line of about eight inches with a heavy sinker on the end. Attach the third swivel to a line of about 30-inches with a hook and bait at the end. The rig allows the bait to float just off the bottom a location popular with catfish. There are catfish in most of the other southern Illinois lakes including Rend Lake where the above photo was taken. Another popular place to fish for them is Little Grassy Lake a1200-acres body of water to the south of Crab Orchard Lake but still in the refuge area. It produces many channel catfish on a regular basis throughout the summer. Whether fishing from shore or boat, in the evening or morning, night or day, catfish are a marvelous fish for action. They can be as finicky as any game fish, and yet do not require a lot of expensive tackle to pursue.